Another gastronomic adventure with food bloggers. This round we venture to Taman Tun Dr.Ismail whereby we manage to hunt for tasty food. Mr Ronnie and Mr Jason welcome us with a warm smile at TTDI Murni Cafe. A spacious and clean environment of the cafe. TTDI Murni Cafe offers an array of yumilicious food range from Asian to Western cuisines. Flavoursome and love the fragrant rice. The portion is generous and worth for money. Great taste of the noodle with the thick gravy. The chewy noodle was lightly coated with fragrantly fried egg to give nice taste and texture. Kung Po Chicken & Rice is their signature dish and I admit this dish is good. Balance taste of their Kung Po Chicken. Spiciness level is acceptable. The stock is rich in flavour with a thick curry sauce and a choice of noodles to select from plus their fresh ingredients. Simply delicious Curry Laksa. Aglio E Olio always my favourite. The Turkey ham gives a twist on the Aglio E Olio. A healthy dish in term of their preparation. The gravy is not too heavy to dominate the chicken taste. Simple preparation of the dish yet it brings satisfaction to the dinners. Simple yet delicious Chicken Piccata that attract dinner attention. The Chicken Piccata will taste perfect if the dish comes with a sauce. No trip to TTDI Murni Cafe is complete without sipping on their drinks. I personally love their carrot milk juice. Once again, I would like to take this opportunity to extend my thanks to Mr Ronnie and Mr Jason for their hospitality. 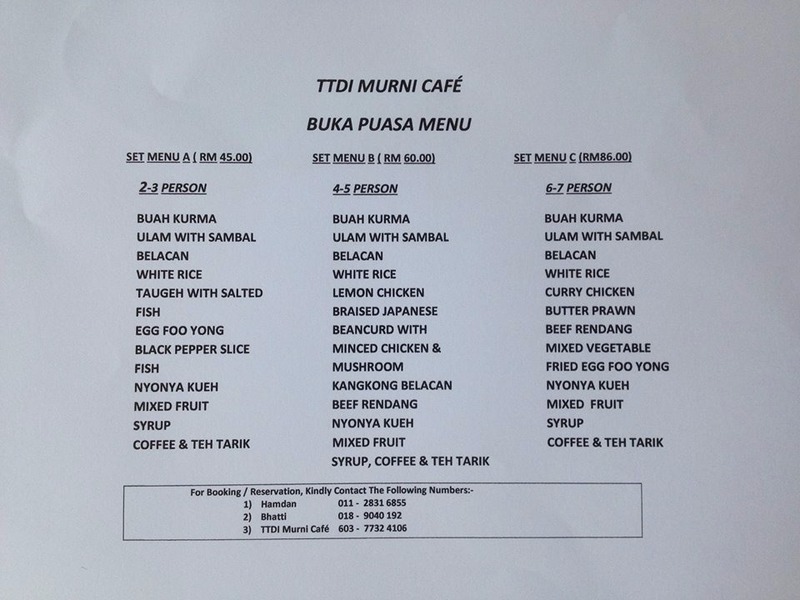 During this wonderful Ramadhan, TTDI Murni Cafe also serves affordable " Buka Puasa" dishes. Special thanks to Racheal from FoodiLIFEcious for the invitation.